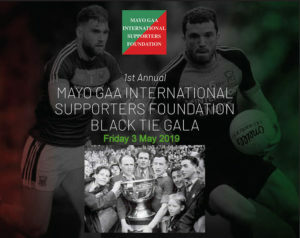 Mayo GAA Foundation is organising a fundraising Gala Dinner, in association with The Ireland Funds, for Mayo GAA in New York on Friday 3 May, before the ‘Green and Red Army’ take on New York in the Connaught Championship two days later on Sunday 5 May. “Our main focus and remit is to harness global support for the future development of Mayo GAA including our new underage academy initiative, our new training centre in Castlebar and other player welfare, educational and development programmes. “From time to time we will also endeavour where possible to provide much-needed support to charities who have strong links and associations to Mayo including the Mayo Roscommon Hospice,” according to Tim O’Leary, Strategic Advisory Group Director with the Mayo GAA International Supporters’ Foundation. Individual tickets (costing $1,000 each) will be on sale online one month before the event. For details on sponsor tables click on the link. About Mayo GAA Foundation: This independent organisation of business professionals from all around the world with close connections to Mayo, give their time and expertise voluntarily to support Mayo GAA in moving forward – both on and off the pitch.